Spring is always such a busy time in my Minnesota garden. Not only do we have to get the gardens tilled and planted, but we have to do lots of cleanup after the long winter… plus lawn maintenance kicks in, and suddenly trimming and edging season is upon us. Whew! This is a sponsored conversation written by me on behalf of Troy-Bilt. 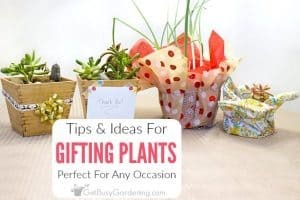 I was also provided with the products mentioned in this post at no charge. All opinions and text are my own. Well, I am one lucky girl! Just in time for the busy gardening season, Troy-Bilt has sent me some new tools to help me out. Troy-Bilt gave me the TB6044 XP™ Straight Shaft Gas String Trimmer to review, PLUS three attachments – and I get to tell you all about it. Everyone with a lawn needs a trimmer, and Troy-Bilt has come up with a trimmer design that turns this one essential piece of equipment into many. Since I got three attachments, my trimmer becomes a blower, a cultivator or an edger with only a tiny amount of effort and no tools required. This is a pretty awesome product, especially great for people like us who have limited garage space. The attachments are small, so they take up way less room than owning each piece of equipment separately would. The attachments even come with hangers, so they are easy to store on the wall or ceiling. Another thing I love about this design is that since the trimmer comes apart, it easily fits in my car. We don’t have a truck, so this is a major bonus we didn’t think about before we had to trim our community garden plots. Plus, since it’s a 4-cycle engine, it takes regular gasoline. So no mixing gas with oil, which is very nice. Back before my gardens expanded, I used to be able to trim the entire yard with our little electric trimmer, no problem. But, now we have so much trimming to do, the battery dies about half way through the chore. My new heavy-duty TB6044 XP™ Straight Shaft Gas String Trimmer 4-cycle gas trimmer makes it all the way around the yard with no problem. It’s much more powerful than the electric trimmer, and the head is wider so it takes less time to trim the same area. 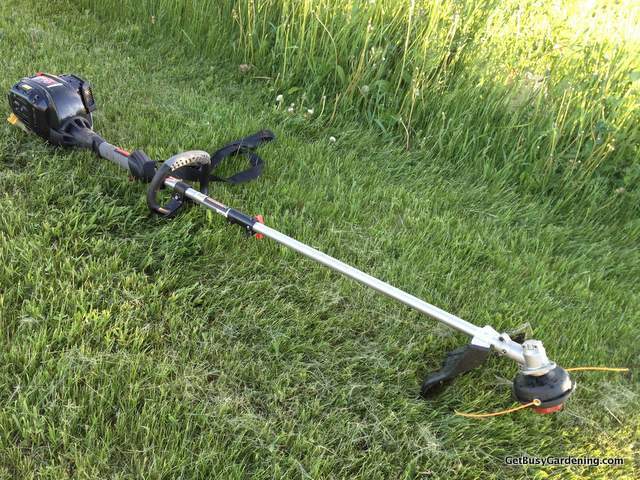 The monster weeds at the community garden are no match for this trimmer. 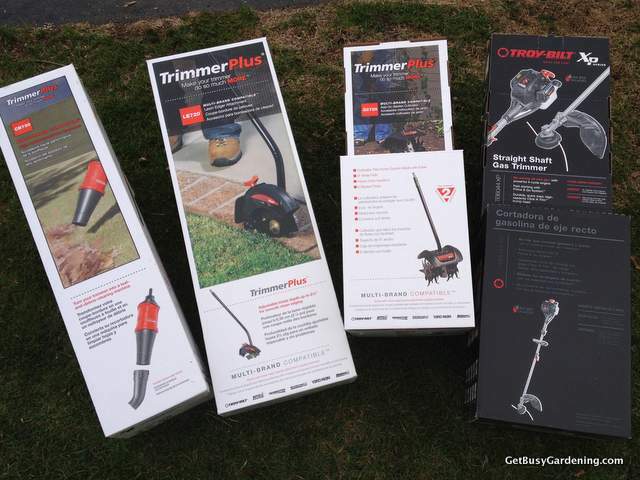 The TrimmerPlus® Add-On Cultivator was the attachment I was the most excited about. Over the past few years, we’ve been adding raised beds to our vegetable garden, so our old cultivator has become obsolete. This cultivator attachment is the perfect size to use on our raised beds. It has enough power that it could be used to till the whole vegetable garden too. I highly recommend this attachment. Edging is a chore that we are not very good at. We have a few neighbors that keep their lawns nicely edged all the time – wow, we’ve been lazy. We’ve borrowed their edger several times, but we don’t want to be those annoying neighbors who borrow their equipment all the time. So, we stopped edging out yard all together. 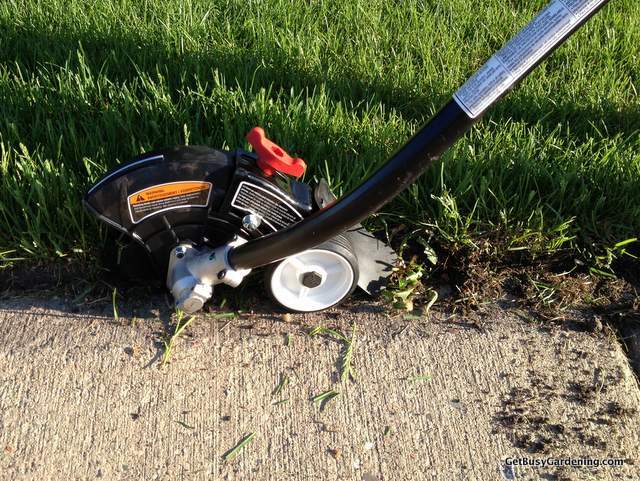 But now, we finally have our own edger – the TrimmerPlus® Add-On Lawn Edger. I don’t remember the last time we edged our lawn, but it’s definitely been a few years. It took some time to get used to how this edger worked, because it’s obviously not going to cut through our thick thatch like butter. 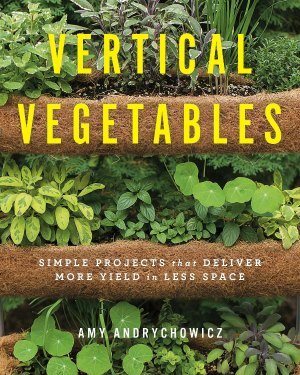 I have to admit, this didn’t work very well for our overgrown edges. We had to cut the edge with a shovel to get it started, and it took a lot longer than we expected to get our edge cleaned up. But, I think if we’re better about edging on a regular basis, this edger should work great. Here’s another piece of equipment that we borrow from our neighbors every year (they love us!). We have arborvitaes, and they are some seriously messy shrubs. Every spring, the path next to the arborvitaes is covered in debris. It’s impossible to get it all cleaned out of the ground cover without a blower. 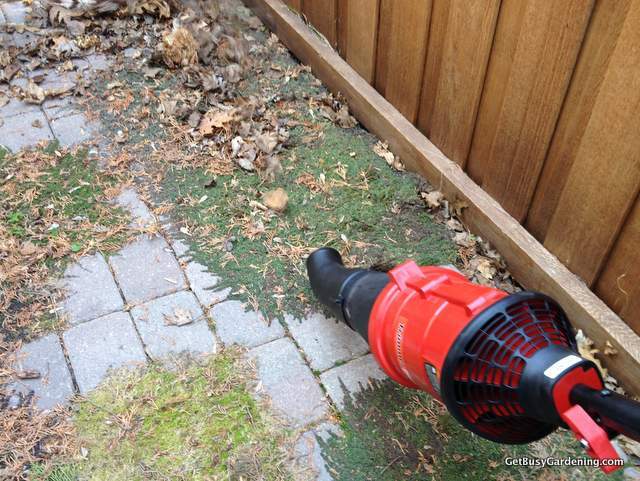 The TrimmerPlus® Add-On High Performance Blower works even better than the one we used to borrow from our neighbor (shhh, don’t tell my neighbor). This blower has power! It only took about 5 minutes to get all the debris off the path and out of the ground cover, it’s great. Plus now we can use it to blow out other debris piles, like the ones on the deck, walk and driveway that build up over the winter. So much easier than sweeping! I think I’ll even use it to blow all the tree seeds out of the gardens this spring before I lay the new mulch down. I can see we’re going to get a lot of use out of this blower. It’s one of those pieces of equipment you didn’t know you needed until you have it. All in all, I really like this product. It has a ton of power which is great, but it can be little scary at first when getting used to the trimmer and edger. Plus it is pretty heavy for me. It comes with a shoulder strap, and once you get used to relying the the should strap, it’s much easier to use. I’m going to be straight with you though, it’s too heavy for me to trim the entire yard. My husband has no problem with it, and he loves the extra power that our little electric trimmer lacked. 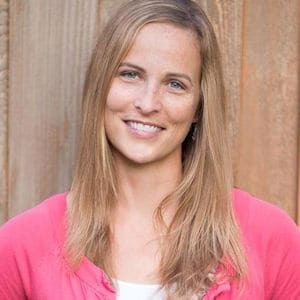 (He says I just need to hit the weights at the gym more often, ha ha) I don’t have a problem with tilling, trimming or using the blower – I just get tired when I try to trim our entire yard. 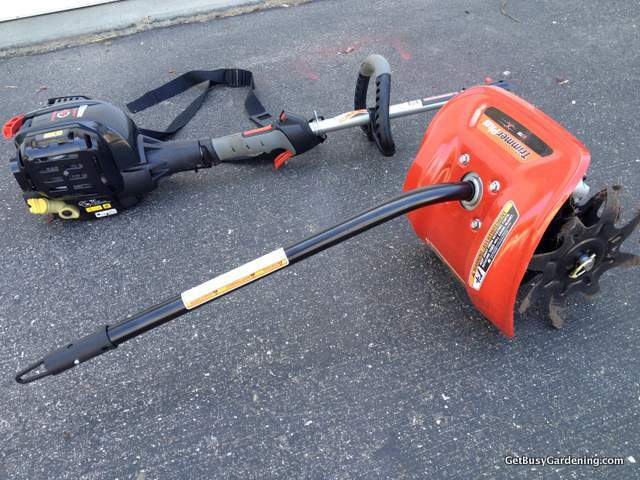 If you’re looking for power, this is definitely the trimmer for you! And guess what, our neighbors have already started asking to borrow OUR lawn equipment. Yep, now we’re the cool kids on the block! Troy-Bilt JET Leaf Blower: The Coolest Kid On The Block! Which attachment is your favorite? Ghis would be ideal for my garden. I have tomatoes,cucumbers,peppers and squash planted.Now I just need to keep tbe weeds out. I don’t have a culivator, my garden is bigger than I planned. I know,this brand of culivator would be a good one,I have a friend that has tools of this brand. I think the blower would be the most useful attachment for me…I’ve been looking for one for quite a while. Would love to win! Troy-bilt makes such great stuff! I think the pole saw would be fun to have. Thanks for the chance to win this trimmer! I would love this edger. It would make weeding a breeze along our rock borders! I used to have a Mantis but it stopped working after one season. The trimmer would be the most useful for me or the blower is pretty awesome! I love the idea of owning one piece of equipment and the attachments to help save space. The edger attachment would be my choice. I have been shopping for a trimmer and really appreciate your product review on this Troy-Bilt model! That power broom would be great for clearing a light snow off the sidewalks here in MN!!! How great it would have been to have this trimmer today instead of the two of us pulling and hand cutting grass all the way around our garden perimeter to keep grass from touching our new electric fence! 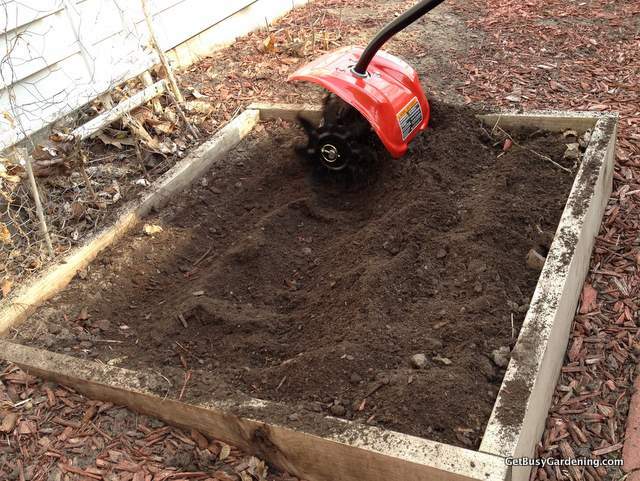 The cultivator would be a nifty tool for our raised beds, too. Glad to know it worked for you. I really like to see the blower in action. I live my other attachments. The tiller looks like it works great but I have a Troybuilt tiller that is over 15 years and still starts on the first pull. The BC720 TrimmerPlus® Add-On Brushcutter would be a great asset in keeping the blackberries out of my yard and garden. Oh my, if I win this I will just cry! Troy-bilt products are in my blood, my family has been using them since they came into being. I still remember my Grandma using her little Troy-Bilt tiller. For me, it’s the cultivator all the way. I would feel like a trendy and fun gardener using that in my raised beds….sigh….oh to be a winner! This would make yardwork a lot more fun! We’re planning to move to an acreage this year or next, so any tool would be helpful that can help me wrangle the place. The cultivator would be so helpful! the time I get to all, I start right back up again, so this would be the ideal addition to my garden. The GC720 TrimmerPlus® Add-On Cultivator is the coolest attachment. The pole saw is my favorite attachment. We have a ton of trees on our property and a pole saw would come in very handy. I think the coolest is the hedge trimmer. Thank you. I definitely need one of those pole saw attachments. There are trees in my yard with my name on them! Thanks for the great review! I would probably say the cultivator would be the coolest. 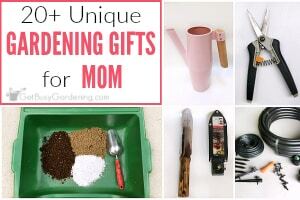 It’d be great for churning the garden bed. Otherwise the edger for getting those perfect lines. This would be put to great use in my garden. The option for multiple attachments look very sweet. String trimmer with the cultivator attachment would do wonders in my green space! Instead of trimming with a trimmer I’ve had to resort to pulling by hand since I’ve been without a working trimmer, and the cultivator sure would come in handy in those tight garden spaces or in turning my compost pile! 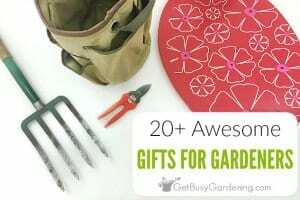 I really like the idea of the lawn edger or the cultivator! Loving all the add ons! The cultivator would be perfect for my existing raised beds and everything I have in mind to add in the next few years! The trimmer would be a life saver. My yard is starting to look like a jungle and that would really help. All the attachments are cool, but my first choice would be the Add-On Cultivator!! The tiller attachment looks sooooo awesome! I love the Cultivator Attachment. It would be great for my garden! The Lawn Edger is the coolest! I so need this for my place. The brush cutter would be the most helpful around here. Thank you! 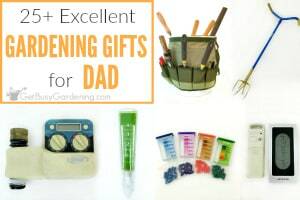 this would be a great gift for my son, although I would love the little cultivator so it might be hard to part with. I like the whole thing! All of the attachments. But, if I have to pick one– it would be the edger! I, too, look at my neighbors perfectly-coiffed lawns with envy and that shovel is just too much work! Enjoyed your review. Appreciate your honesty! I would love that little cultivator! I would love to have the trimmer with the blower attachment.! Wow what a Blessing that would be to win. My old blower is has just about had it. The blower is what I need most – it would be great to blow away snow in the winter. But I also need a trimmer. I have a cheap electric one that just will not work. What a generous give-away! Thank you. I think that cultivator would change my life. The add on cultivator because I am in my 50’s and using a hoe is hard on me. Definitely the cultivator for me. I built a 16×20 raised bed 3 yrs ago and have been battling clay with hay and horse manure. Breaking up that hay with a spade is hard and tedious. A cultivator would definitely help me in the War on Clay!!! The cultivator attachment is awesome. I’ve read a few reviews on the whole product and it seems like it is very good. Very excited. The trimmer would be most useful to me. Troy-Built brand has great products. Love the chance to win on, thanks. 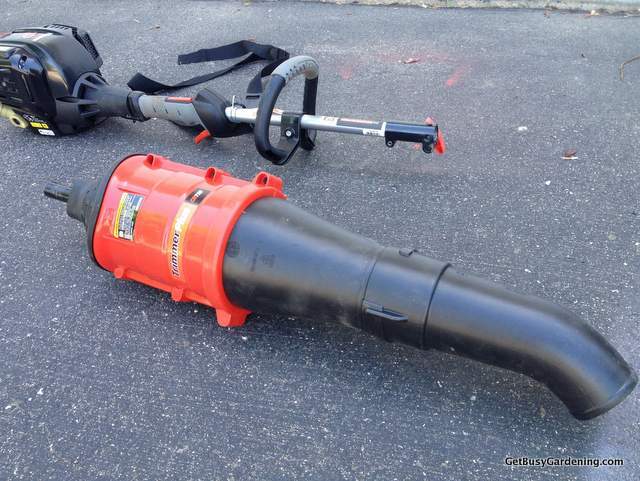 I have been looking for a powerful blower and would love to have this Troy Product! All attachments would be useful but a lawn job is not complete unless it is edged nice and neat. I think the blower is my favorite. Between the front and back yards we have more than 10 full grown trees. Oak, Pine, Pear, Cherry and a few I can’t figure out. It seems like the builders went into the woods and just dug up trees to plant with no rhyme or reason. That cultivator attachment is way cool! I have the same scenario as you, with raised beds that this would be perfect for. Trimmer with the blower attachment would make my job alot EASIER ! I’d like the cultivator attachment. Thanks for the chance! Good review. Like the honesty in stating that the edger came up a bit short on a long ago unedged lawn. But for me, I’d have to go with the cultivator. I can pay the local lawn guy $5 to edge my lawn. I would love & need the trimmer because a gardener 85 yrs. old. Margie Olson. A gardener of 85 yrs. old who would love a trimmer. The cultivator would be wonnderful , had to do all my garden by hand this year! The add on tubo blower would be awesome…but the add on cultivator!!!! I would be in heaven! Our ground is so very hard and this would allow mixing in amendments nicely! Then I would have anough home groen organic produce to share with many folks!! And, don’t you hate it when you hit “post” THEN see the typos? I think the blower attachment would be cool to have. I have used the string trimmer and the cultivater attachments. I am currently without my machine that I have had for about 5 years, due to the drive shaft shearing. I has had very hard seasons helping me take care of our acre of yard. I just bought the pole saw attachment, but have not had a chance to use it. Waiting to get my machine repaired. Could sure use another. I’d love a chance to win this to help out with our 1 acre yard and all my work on our small ranch. I would be interested in either the add-on cultivator or the add on brush cutter as I could use both of them on our small ranch. I would love to add the blower attachment. It would be nice to have a blower in the fall to move those leaves around with out destroying the beds they cover. That’s really nice! Great product! The blower attachment would be awesome for raking up leaves in the fall. I’d love a chance to win the edger. That would be the most useful for me. That cultivator attachment looks great! Great products! The blower attachment would be awesome for raking leaves in the fall. I would love this along with the cultivator! I could use both attachments for my yard and garden’s. Your post said it was open only til Friday June 6th, yet a new post this morning Sunday June 8th say’s I still have a chance. Either way it’s still a great giveaway for a lucky winner! Have a happy Sunday! The blower attachment looks like it would make short work of the grass and leaves on my deck and patio. I’d love to give it awhirl with the leaves this fall! Much more handy and more fun than raking! I’m responsible for over 30 acres of savanna and woodland at a private retreat center in the Kettle Moraine region of Wisconsin. Good tools go a long way toward making short work of big chores. I’d find a use for any of these attachments but the blower would be the first one I’d grab. It’s a lot of work to clean up all the debris left behind when you’re working on a large project! 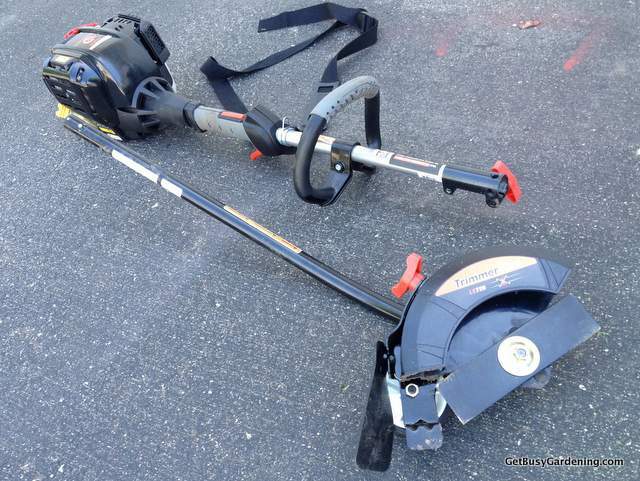 A brush cutter would be a great add-on too but I don’t see it listed as one of the three attachments discussed here. Thank you. And ours just died yesterday! This would be a huge win for us. 🙂 The cultivator attachment would make it extra sweet.